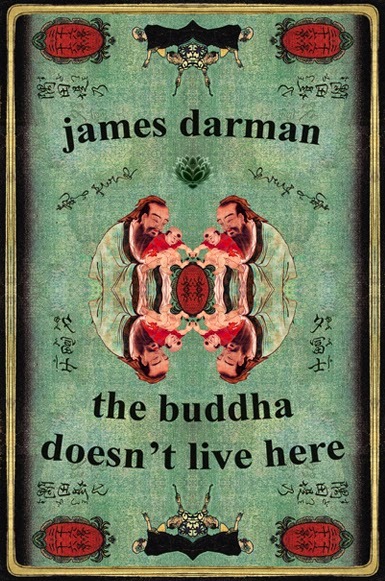 BOLD MONKEY: Book Review: James Darman the buddha doesn’t live here. Epic Rites Press, Sherwood Park, 2013 (48 pages). Book Review: James Darman the buddha doesn’t live here. Epic Rites Press, Sherwood Park, 2013 (48 pages). There are thirty-three poems in this slim book. About ten have previously appeared in Rob Plath’s short-lived on-line mag ‘Exuberant Ashtray’: http://rsplath.wordpress.com/2009/01/05/111/ the buddha doesn’t live here derives its name from the seven page narrative title poem. The persona, presumably the poet, lives in extreme poverty in a derelict house. He takes the reader on a guided tour through his house and onto the neighbouring cold streets. As he enters a coffee shop, he notices a smiling picture of the Buddha on the wall and concludes, “2515 Manton St./ the Buddha doesn’t/ live here/ he dwells nowhere at all/ this house is perfectly empty.” Instead like John Locke, Darman surmises that the source of his knowledge derives from his senses rather than from some unseen world beyond: “these/ weather-beaten bones/ accept/ the cold rain/ thru every pore”. Darman is a poet of despair who has been highly influenced by the American poet Rob Plath’s style and subject matter. Both use free verse with a leaning towards lower-case & truncated words. Both pare their poems to the bone and write confessional poetry to document the pain of their descent into some sort of undefinable existential void. In Darman’s world there is no god. He believes we are trapped by a system heavily weighted against us and that our ultimate purpose is to learn to face the meaninglessness of existence alone. Wine and quiet reflection can sometimes help make life more bearable but death is our only reprieve. Darman seems to revere squalor and a monk-like silence punctuates his verse. He lives fully aware that he lacks ambition and that his life is disintegrating all around him, “I am-// 10,000 things/ turning to dust”- without regret or self-pity. Darman’s originality, in part, derives not only from his stance as a homeless person but also from his ability to achieve a sense of twisted unity in his work through his use of stark natural motifs- birds, beetles, lizards, cats, flowers, stars, sun, sky, home, trees, garden clouds, moon, wine, river- to name a handful of the images which populate his verse. Usually these words have positive connotations, but in Darman’s melancholic hands they often resonate with morbid or sinister associations. In his bed-of-nails figurative take on life, birds shriek “idiot songs”, a morning flower is “torn w/buckshot & suicide”, his chest is “a deep frozen river”, the sun “turns like rancid butter’ and the like. Darman turns natural restorative images inside-out to reveal a dark malise at his core. The beauty of the poem lies in its rebelliousness but also in the understated way in which it rejects mainstream American values. The listing of its complaints about society’s expectations- a nice family, car and job- recalls Bukowski’s poem ‘machineguns towers & timeclocks’ from his Crucifix in a Deathhand collection. Where this poem goes a step further is in its denial of betterment, in its caustic incorrigible view of the damaged. From the “weeds & wildflowers” of his mind, Darman has thrown us this bright brittle gem from the American underclass. I hope one day that James Darman will resurface- but not with a new found god or love, or cheery, self-satisfied smile.